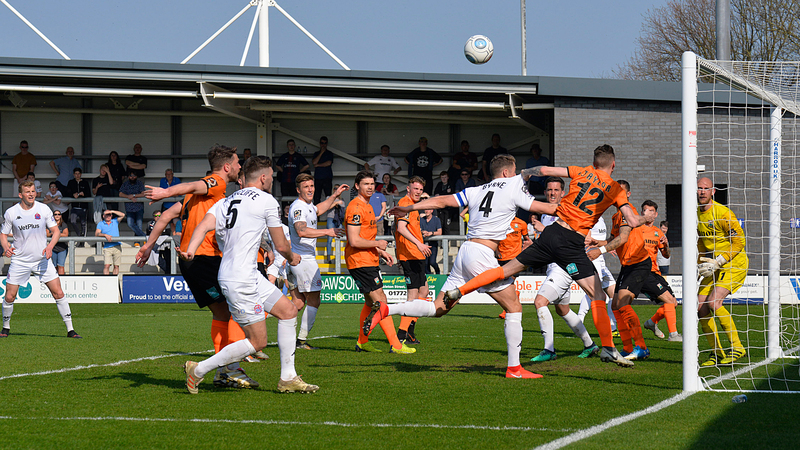 AFC Fylde bounced back to winning ways, after Danny Rowe’s first-half volley was enough to condemn ten man Barnet to their third straight defeat. The Coasters wrung the changes following defeat to Braintree Town, with Crawford, Bond and Burke regaining their places in the team, with the squad shifting to a 433. Barnet started strongly, winning a free-kick early on which saw Croasdale pick up a yellow card. The delivery was cleared easily, but Barnet came knocking once again, with the ball falling beautifully to Jack Taylor. Taylor took his shot well, and looked to be firing the Bees to an early lead – only for it to strike his teammate Reynolds on the line, and deflect behind. The Bees continued the better of the sides in the opening exchanges, with Mason-Clark driving at goal before unleashing a fierce effort that wound just wide of Lynch’s post. It took just over 15 minutes for Fylde to feel their way into the game, with Crawford’s exquisite chipped pass finding a sharp run from Bradley, who cut back to Rowe. Rather than pull the trigger, however, Rowe tried playing it back to Bradley, and the chance came to nothing, despite the promising position. The next time this was attempted, however, it was an altogether different result. A beautiful ball from Crawford was nodded back to Rowe by Bradley; an inviting set-up for a man who loves to hit the ball from distance. Rowe duly obliged, and on the volley guided it beyond Cousins into the bottom left corner, giving the Barnet stopper no chance. Barnet had chances to draw themselves level, with the best chance falling to Sweeney at the back post following a deep cross into the back post, but the defender’s header was guided well wide of the post. It would prove to be a pivotal moment for Sweeney, whose next big involvement was one of much debate. After Haughton nicked a loose ball past Sweeney, he was hacked down by the Barnet man, getting none of the ball in the process. Haughton, despite pulling himself out of a full-blooded tackle, felt the full brunt of it, and whilst he lay on the floor, referee Joe Hull had an important decision to make. Sweeney was shown a red card, which on another day perhaps may have been only a yellow, and Barnet’s task of overturning the deficit looked all the more difficult. Fylde’s second-half start couldn’t have been more of a contrast from their first; free-flowing football with plenty of chances across the front line. Rowe, Croasdale and Bradley all had chances in the first ten minutes, with the extra player proving to be an obvious advantage. Crawford went closest to doubling the lead, after a short corner routine eventually found its way to the edge of the box , where Crawford was waiting to strike – but his curled effort just over the bar. With Barnet having to attack to earn themselves something from the game, they left themselves open to the odd counterattack, as Dan Bradley’s low ball found Rowe on the corner of the box. Rowe cut in and tried to pick out the top right corner, but got his effort slightly wrong, and the shot skewed harmlessly behind. Luke Burke enjoyed himself on the right-hand side, with a few moments of individual skill opening the Bees backline brilliantly on occasion. One of these saw the ball drop to Nick Haughton, who curled a whipped effort towards the back post, which Cousins was equal to. The introduction of Philliskirk and Tasdemir offered fresh legs against a tiring Barnet’s side, with Philliskirk’s header from a corner cleared off the line in a last-ditch attempt. Despite patiently probing, and looking to see the game out comfortably, Barnet showed they still had appetite to come away with a share of the spoils. A quick counter saw Mason-Clark slipped through one-on-one with Jay Lynch, and Coasters hearts were in their mouth. Fortunately, the linesman flag was up on the far side and, testament to Jay Lynch, Mason’s Clark effort was pushed behind. The game finished in the same manner, with Fylde having half-chances to finish the game, but the whistle came for full time, and with it, the 15th home win of the season. “Obviously we’re really pleased to win, and the first fifteen minutes showed how tough it was, as we couldn’t get close to them,” said Dave Challinor. AFC Fylde: Lynch, Francis-Angol, Byrne, Tunnicliffe, Burke, Crawford (Philliskirk 70’), Croasdale, Bond, Haughton (Hardy 83’), Rowe, Bradley (Tasdemir 77’). Barnet: Cousins, Alexander, Johnson, Reynolds (C), Coulthirst (Tarpey 68’), Taylor, Taylor, Boucad (Robson 58’), Elito (Akinola 61’), Sweeney, Mason-Clark.